Definition at line 55 of file rfc1035.h. Definition at line 59 of file rfc1035.h. Referenced by rfc1035HeaderPack(), rfc1035HeaderUnpack(), testRFC1035::testBugPacketEndingOnCompressionPtr(), and testRFC1035::testHeaderUnpack(). Definition at line 65 of file rfc1035.h. Referenced by rfc1035HeaderPack(), rfc1035HeaderUnpack(), rfc1035MessageUnpack(), testRFC1035::testBugPacketEndingOnCompressionPtr(), and testRFC1035::testHeaderUnpack(). Definition at line 69 of file rfc1035.h. Referenced by idnsCallbackOneWithAnswer(), idnsGrokReply(), and rfc1035MessageUnpack(). Definition at line 67 of file rfc1035.h. Referenced by rfc1035BuildAQuery(), rfc1035BuildPTRQuery(), rfc1035HeaderPack(), rfc1035HeaderUnpack(), rfc3596BuildHostQuery(), testRFC1035::testBugPacketEndingOnCompressionPtr(), and testRFC1035::testHeaderUnpack(). Definition at line 56 of file rfc1035.h. Referenced by idnsGrokReply(), rfc1035BuildAQuery(), rfc1035BuildPTRQuery(), rfc1035HeaderPack(), rfc1035HeaderUnpack(), rfc3596BuildHostQuery(), testRFC1035::testBugPacketEndingOnCompressionPtr(), and testRFC1035::testHeaderUnpack(). Definition at line 66 of file rfc1035.h. Definition at line 58 of file rfc1035.h. Definition at line 64 of file rfc1035.h. Referenced by rfc1035BuildAQuery(), rfc1035BuildPTRQuery(), rfc1035HeaderPack(), rfc1035HeaderUnpack(), rfc1035MessageUnpack(), rfc3596BuildHostQuery(), testRFC1035::testBugPacketEndingOnCompressionPtr(), and testRFC1035::testHeaderUnpack(). Definition at line 57 of file rfc1035.h. Definition at line 68 of file rfc1035.h. 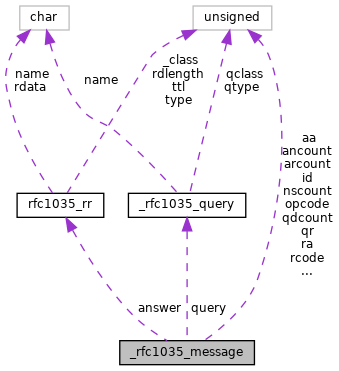 Referenced by idnsGrokReply(), and rfc1035MessageUnpack(). Definition at line 62 of file rfc1035.h. Definition at line 63 of file rfc1035.h. Definition at line 61 of file rfc1035.h. Definition at line 60 of file rfc1035.h. Referenced by idnsGrokReply(), rfc1035HeaderPack(), rfc1035HeaderUnpack(), testRFC1035::testBugPacketEndingOnCompressionPtr(), and testRFC1035::testHeaderUnpack().